AVEXIS is a high throughput protein interaction assay developed to systematically screen for novel extracellular receptor-ligand pairs involved in cellular recognition processes. It is specifically designed to detect transient protein interactions that are difficult to identify using other high throughput approaches. Kerr, J. S., Wright, G. J. Avidity-based Extracellular Interaction Screening (AVEXIS) for the Scalable Detection of Low-affinity Extracellular Receptor-Ligand Interactions. J. Vis. Exp. (61), e3881, doi:10.3791/3881 (2012). Extracellular protein:protein interactions between secreted or membrane-tethered proteins are critical for both initiating intercellular communication and ensuring cohesion within multicellular organisms. Proteins predicted to form extracellular interactions are encoded by approximately a quarter of human genes1, but despite their importance and abundance, the majority of these proteins have no documented binding partner. Primarily, this is due to their biochemical intractability: membrane-embedded proteins are difficult to solubilise in their native conformation and contain structurally-important posttranslational modifications. Also, the interaction affinities between receptor proteins are often characterised by extremely low interaction strengths (half-lives < 1 second) precluding their detection with many commonly-used high throughput methods2. Here, we describe an assay, AVEXIS (AVidity-based EXtracellular Interaction Screen) that overcomes these technical challenges enabling the detection of very weak protein interactions (t1/2 ≤ 0.1 sec) with a low false positive rate3. The assay is usually implemented in a high throughput format to enable the systematic screening of many thousands of interactions in a convenient microtitre plate format (Fig. 1). It relies on the production of soluble recombinant protein libraries that contain the ectodomain fragments of cell surface receptors or secreted proteins within which to screen for interactions; therefore, this approach is suitable for type I, type II, GPI-linked cell surface receptors and secreted proteins but not for multipass membrane proteins such as ion channels or transporters. The recombinant protein libraries are produced using a convenient and high-level mammalian expression system4, to ensure that important posttranslational modifications such as glycosylation and disulphide bonds are added. Expressed recombinant proteins are secreted into the medium and produced in two forms: a biotinylated bait which can be captured on a streptavidin-coated solid phase suitable for screening, and a pentamerised enzyme-tagged (β-lactamase) prey. The bait and prey proteins are presented to each other in a binary fashion to detect direct interactions between them, similar to a conventional ELISA (Fig. 1). The pentamerisation of the proteins in the prey is achieved through a peptide sequence from the cartilage oligomeric matrix protein (COMP) and increases the local concentration of the ectodomains thereby providing significant avidity gains to enable even very transient interactions to be detected. By normalising the activities of both the bait and prey to predetermined levels prior to screening, we have shown that interactions having monomeric half-lives of 0.1 sec can be detected with low false positive rates3. Compile a list of cell surface receptor and secreted proteins of interest to be screened for interactions and retrieve their sequences from a suitable protein sequence database. Most proteins containing an N-terminal secretory signal peptide are suitable (these include type I, GPI-linked and secreted proteins). Typically, a protein family (e.g. immunoglobulin superfamily or all receptors restricted to a specific cell type such as the erythrocyte) would be selected. Determine the extent of the extracellular regions by identifying the location of the signal peptide and transmembrane region using protein feature prediction software. We typically use SignalP v3.05 and TMHMM v2.06. Design primer sets that amplify the entire ectodomain fragment for each receptor. We have a suite of bait and prey vectors that are suitable for this purpose which are available from Addgene (http://www.addgene.org/). Design the sense primer around the start methionine to include a NotI restriction enzyme site and an optimal Kozak sequence; this is followed by 25 base pairs of exact match gene-specific sequence (Fig. 2A). Design the antisense primer to truncate type I receptor proteins just prior to the predicted transmembrane region so as to express the entire ectodomain as a soluble recombinant protein. Include an AscI restriction site in this primer which should then translate in frame to a C-terminal rat Cd4d3+4 protein tag7 (Fig. 2A). Amplify the ectodomain fragments from all genes using these primers and clone them into the bait or prey vector. We sometimes find it helpful to first clone them into shuttle vectors before subcloning into an appropriate mammalian expression vector, we use a derivative of the pTT3 vector3,4. Both the bait and prey vectors contain C-terminal protein tags as follows (Fig. 2B). Baits: A tag containing domains 3 and 4 of the rat Cd4 (Cd4d3+4) protein followed by a peptide sequence that is a substrate for the E.coli BirA enzyme and can therefore be monobiotinylated on a specific lysine residue (Fig. 2B). The Cd4d3+4 tag is recognised by the OX68 monoclonal antibody and is used to quantify the expression of the bait proteins by ELISA. The bait proteins are therefore monomeric and monobiotinylated. Additional bait protein vectors where the biotinylatable peptide is replaced by a 6-his tag for purification are available. Preys: The preys also contain a rat Cd4d3+4 tag followed by a peptide sequence from the rat cartilage oligomeric matrix protein (COMP) and a C-terminal β-lactamase enzyme. The COMP peptide ensures the prey forms pentamers once expressed (Fig. 2B). We use a convenient high-level expression system using suspension culture of the HEK293E cell line4 to produce our protein libraries, but any mammalian expression system should be suitable. A commercially available alternative is the Freestyle system. Cells are routinely cultured on a shaking platform (125 r.p.m.) at 37 °C, 5% CO2 at 70% relative humidity. Both positive and negative control proteins must also be expressed. The rat Cd4d3+4 tag-only fragment is available as both a bait and prey and are suitable negative controls. Similarly, bait and prey vectors that encode a positive control are available (Addgene); we typically use the rat Cd200- Cd200R interaction8. Seed the HEK293E cells the day prior to transfection at a density of 2.5 x 105 cells mL-1. We routinely culture the cells in volumes of 50 mL in Freestyle293 media following the manufacturer's recommendations. To ensure efficient biotinylation, supplement the cell culture medium used to produce bait proteins with D-biotin to a final concentration of 100 μM. Medium used to express the prey proteins does not need to be supplemented with additional D-biotin. The following day, transfect cells using a suitable transfections reagent (e.g. 293fectin). Use 25 μg of the bait or prey plasmid constructs to transfect a 50 mL culture. To produce the biotinylated baits, co-transfect the plasmid encoding the bait construct with a plasmid that encodes a secreted form of the E.coli protein-biotin ligase (BirA) which is available from Addgene. Co-transfect bait plasmids at a 10:1 ratio (2.5 μg) of the plasmid encoding the secreted BirA protein. Harvest cultures five days post-transfection by first pelleting the cells by centrifugation at 3000 xg for 20 minutes followed by filtration of the supernatant through a 0.22 μM filter. One of the key features of the AVEXIS assay is that because the recombinant proteins are secreted they can be diluted or concentrated (normalised) to within established threshold activities prior to being used in the assay. We have found that the levels at which the recombinant proteins are expressed span a wide range - up to 4 orders of magnitude - and so the normalisation step significantly reduces the number of false positives during the screens. Note: Unconjugated D-biotin must be removed from the media (typically by dialysis) since it will compete with the biotinylated bait protein for binding to streptavidin binding sites. Transfer bait supernatants into dialysis tubing, label, clip securely and dialyse extensively against a suitable buffer such as PBS to remove free biotin. Perform an ELISA to determine the relative levels at which the bait proteins are expressed. Prepare a dilution series of the biotinylated bait proteins and capture them on a streptavidin-coated microtitre plate. Use the rat Cd4d3+4 tag to detect and quantify the captured bait proteins using a monoclonal antibody (OX68). Concentrate or dilute bait proteins to the minimum amount required to saturate all the biotin binding sites in the well of a streptavidin-coated plate. Block the wells of a streptavidin-coated plate with phosphate buffered saline/0.1% Tween-20 (PBST)/2% bovine serum albumin (BSA) for 15 minutes. 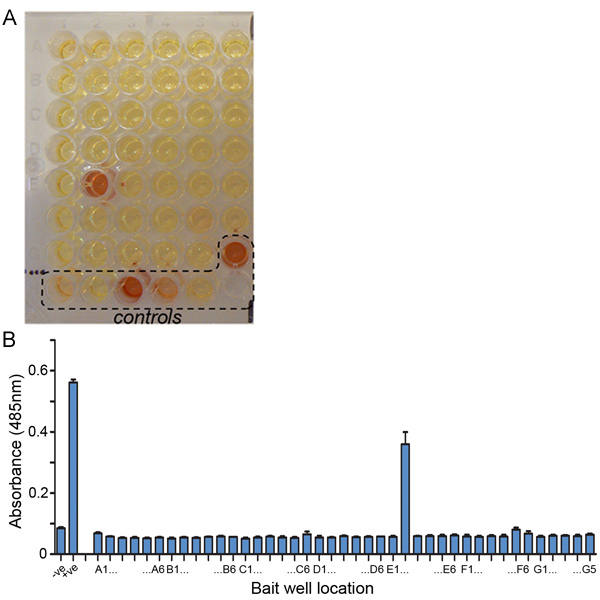 In a separate plate, make a dilution series (four 1:3 dilutions are usually sufficient) of the bait proteins in PBST/2% BSA and transfer to wells of a streptavidin-coated plate. Incubate for 1 hour at room temperature. Wash 3x in PBST. Add 100 μL of 2 μg/mL mouse anti-rat Cd4d3+4 IgG (OX68) incubate for 1 hour at room temperature. Wash 3x in PBST. Add 100 μL of anti-mouse alkaline phosphatase at 1:5,000 dilution in PBST/2% BSA and incubate for 1 hour at room temperature. Wash 3x in PBST and perform a final wash in PBS to remove any residual detergent. Add 100 μL of 1 mg/mL Substrate 104 in diethanolamine buffer (10% diethanolamine (v/v), 0.5mM MgCl2, 10 mM NaN3, pH9.8, stored protected from light at 4 °C). After one hour, measure absorbance at 405 nm. Representative bait normalisation results are shown in Figure 3A. Bait proteins that are expressed at levels that are insufficient to saturate all the biotin-binding sites of a streptavidin-coated plate, when used undiluted, should be concentrated using Vivaspin concentrators (Vivascience, 10kDa MWCO). As a guide, we estimate that ~5 μg of a typical bait protein (~80 kDa) is sufficient to saturate a 96 well plate. Bait proteins expressed at high levels can be diluted in PBST/2% BSA to a concentration sufficient to saturate the streptavidin-coated plate. The activity of the baits should be rechecked after dilution or concentration to ensure that they saturate all the biotin binding sites in the streptavidin-coated plate. Quantify the relative levels at which the prey proteins are expressed using the β-lactamase enzyme activity. First, make a dilution series of the supernatant containing the prey proteins in PBST/2%BSA buffer. Then add 20 μL of the dilutions to 60 μL of a 242 μM (0.125 mg/mL) nitrocefin solution (Calbiochem). Immediately transfer the plate to a microtitre plate reader that takes an absorbance measurement at 485 nm every minute for 20 minutes at room temperature. Representative prey normalisation results are shown in Figure 3B. Concentrate samples using centrifugal concentrators or dilute them in PBST/2%BSA to reach a threshold activity of ~2 nmol min-1 turnover of nitrocefin. Practically, this is achieved if all the nitrocefin is hydrolysed within ~7 minutes. Wash a streptavidin-coated plate in PBST. Add 100 μL of PBST/2%BSA to each well and incubate for 30 minutes to block any spurious protein binding sites within each well. Remove the blocking solution with a smart flick of the plate over a sink and add 100 μL normalised biotinylated monomeric bait to the appropriate wells and incubate for 1 hour at room temperature. Remove the bait samples from the plate by upturning the plate and smartly flicking over a sink, and wash 3 times in PBST. Add 100 μL of the normalised pentamerized prey construct to each well and incubate at room temperature for 1 hour, wash as in step 4.4 and perform one final wash with PBS only. Add 60 μL of 242 μM nitrocefin solution (dissolve 5 mg of nitrocefin in 500 μL of DMSO, mix thoroughly and then further dilute the nitrocefin in 40 mL PBS and pass through a 0.22 μM filter before adding to the plates) and incubate at room temperature. Positive interactions can be observed by eye since the yellow nitrocefin is hydrolysed to a red colour. Quantify by reading absorbance at 485 nm using a plate reader. A typical plate and quantitation is shown in Fig. 4. An example of a representative AVEXIS screening plate is shown in Figure 4. One should observe hydrolysis (yellow to red) of the nitrocefin substrate in the positive control wells (both the antibody-mediated prey capture control and also positive control interaction) within about ten minutes. Some interactions within the screen are also observed within this time scale, but others may take longer (a few hours) to appear. Typically, a hit-rate of around 0.4-0.6% (a positive interaction for every 150-250 interactions being screened) is typical, depending on the protein libraries being screened. Figure 1. Identification of receptor-ligand interactions mediating cellular recognition processes using AVEXIS . The schematic shows two interacting cells (A and B) exchanging information through interactions made between membrane-embedded receptor proteins. AVEXIS is a scalable protein interaction assay specifically designed to identify novel receptor-ligand pairs which are characterised by very weak interaction strengths. 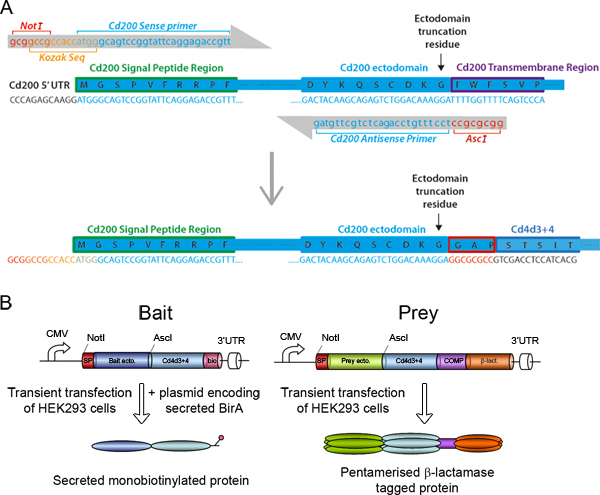 Recombinant soluble protein libraries representing the whole ectodomain of the cell surface receptor repertoire of both cells are compiled either as pentameric β-lactamase-tagged preys (cell type A) or monomeric biotin-tagged baits (for cell type B). The pentamerisation of the preys increases the local concentration of the ectodomains to effect an overall avidity gain so that even very transient interactions can be detected. The bait library is arrayed on streptavidin-coated plates and systematically probed for interactions with the prey proteins. After a brief wash, any captured preys are detected using the β-lactamase activity associated with the prey. Figure 2. Bait and prey construct design. (A) The rat Cd200 receptor protein is provided as an example of how the entire ectodomains of cell surface receptor proteins are determined and primers are designed to make both bait and prey expression constructs. The cDNA and translated protein sequence are shown from the N-terminal signal peptide to the membrane-spanning transmembrane region of rat Cd200. A sense primer is designed to include a 5' NotI restriction enzyme site and optimal Kozak sequence followed by 25 bases of exact match sequence to the Cd200 cDNA sequence. The antisense primer contains an AscI site and 25 bases of exact match sequence located immediately upstream of the selected ectodomain truncation residue. To keep the ectodomain in frame with the rat Cd4d3+4 tag, the AscI site should translate as Gly-Ala-Pro. (B) Schematic representations of the bait and prey expression constructs. Each contains receptor ectodomains flanked by NotI and AscI sites and a Cd4d3+4 tag. The baits contain a C-terminal peptide sequence that can be specifically monobiotinylated by cotransfection with a plasmid expressing a secreted BirA enzyme. The preys are followed by the pentamerisation sequence from the cartilage oligomeric matrix protein (COMP) and the β-lactamase enzyme. Figure 3. Normalisation of the bait and prey proteins. (A) Representative examples of bait normalisation. A dilution series of four different dialysed bait supernatants were detected by ELISA using an anti-Cd4 tag monoclonal antibody. The four baits are expressed at different levels 1>2>3>4. Baits should be normalised to a threshold level that saturates the biotin binding sites in each well. Highly-expressed baits can be diluted to conserve protein (e.g. bait 1 could be diluted ~1:100), and poorly-expressed baits concentrated. Decreased readings at low dilutions are sometimes observed in some baits (e.g. bait 2) which is attributable to the presence of unconjugated D-biotin due to incomplete dialysis. (B) The levels at which prey proteins are expressed is quantified using the hydrolysis rate of a β-lactamase substrate, nitrocefin. In the example shown, the three preys are expressed at different levels: prey 1>2>3. Preys should be normalised to an activity of ~2 nmol min-1, which corresponds to complete hydrolysis of 14.5 nmol nitrocefin in ~7 minutes (e.g. prey 1). The other preys in this example should be concentrated before use in screening. Figure 4. Representative AVEXIS screening results. (A) A photograph of a representative AVEXIS screening plate. A prey protein is probed against 41 different baits and a positive interaction is detected in well E2. Controls used in the screening plates include: a biotinylated anti-Cd4 antibody to capture all the prey protein added to the well (G6), a control interaction: rat Cd200 (bait)-Cd200R (prey) with the Cd200R prey used at threshold dilution (H3), 1:10 (H4) and 1:100 (H5). Negative controls were: a Cd4d3+4 bait probed with the prey protein being screened (H1) and the Cd200R prey (H2). (B) Quantification of the absorbance values of the same screen performed in triplicate. Data points are mean ± SD. When living cells are observed in vivo, their plasma membranes exhibit highly dynamic behaviours: extending and retracting membrane processes as they contact and communicate with their neighbours2. The physical interactions between the membrane-embedded receptor proteins which mediate many of these contacts have evolved to be extremely weak so as to permit this highly motile behaviour. It has been estimated that monomeric interaction strengths as weak as 50 μM could be sufficient to drive spontaneous interactions at physiological receptor densities9 which makes detecting novel interactions extremely challenging2,10. The AVEXIS method described here provides a sensitive method for detecting transient extracellular protein:protein interactions that can be implemented in a scalable manner with a low false positive rate. While other scalable methods have been developed to detect extracellular interactions11-15, one advantage of AVEXIS is that the experimental parameters such as the bait and prey activities have been quantified to detect even the weakest of interactions (t1/2 ≤ 0.1 s) while retaining a low false positive rate3. In addition, the streamlined and robust sample preparation procedures have enabled this assay to be implemented on a much larger scale than other assays and we have recently described a systematic interaction screen totalling over ~16,500 potential interactions16. The assay can be performed on any protein for which it is possible to express a soluble recombinant protein fragment. This therefore includes proteins that contain an N-terminal signal peptide such as type I, GPI-linked and secreted proteins. We have recently designed a suite of vectors that now enable us to express type II proteins as baits17. The assay is not generally suitable for multipass membrane proteins such as ion transporters or pumps since they are unlikely to be correctly folded outside the context of a plasma membrane. We have applied this to a variety of different systems and have successfully expressed extracellular proteins from zebrafish3,16,18, human, mouse and P. falciparum for interaction screens. In terms of the resources required to set up an AVEXIS screen, we have found that a significant bottleneck is the selection, construction, and full sequencing of the expression plasmids. This aspect of the method can take up to a year to make ~100 bait and prey constructs; however, with the decreasing cost of gene synthesis, we now favour commercially outsourcing this aspect of the project. The mammalian expression system together with a large shaking tissue culture incubator (we use an INFORS HT Multitron Cell) enables a single researcher to express and normalise up to ~100 bait and prey proteins a month. Once the proteins are produced and normalised, screening for interactions is rapid with up to twelve 96-well plates being conveniently processed per day. The only bespoke equipment that we have developed to facilitate the production of such a large number of proteins is a compressed air-driven piston which is used to pass up to five supernatants through a 0.22μm filter in parallel. The main class of interactions that might be missed when compared to interactions expected from the literature (false negatives) are homophilic interactions, although some of these interactions can be detected3. In the cases where expected interactions are not detected, we believe that this is due to the formation of homophilic interactions by the prey proteins (a prey "masking" effect) which then prevents further interactions with immobilised bait proteins. The frequency at which interactions are detected depends upon the content of the protein library being screened. As a guide to the reader, a screen of >30,000 interactions within the zebrafish immunoglobulin superfamily resulted in 188 positives - a frequency of 0.6%3,16,18. A very rapid check that can be performed to verify any positive hits is to determine whether the interaction can be detected in both bait-prey orientations; that is, can the same interaction be detected irrespective of whether the binding proteins are present as either a bait or a prey. Whenever we have observed this reciprocation behaviour, the binding has subsequently been shown to be specific by demonstrating direct saturable binding of purified proteins using surface plasmon resonance. It should be stressed that because we increase binding avidity by artificially pentamerising the prey proteins, we do not consider the assay suitable for quantitatively comparing interaction strengths. To obtain biophysical binding parameters of interactions we use monomeric proteins and surface plasmon resonance. Finally, once an interaction has been identified, the high throughput nature of the assay makes it relatively easy to adapt the assay to screen for reagents such as antibodies or small molecules that block the interaction. This work was supported by the Wellcome Trust grant number  awarded to GJW. Fagerberg, L., Jonasson, K., von Heijne, G. Prediction of the human membrane proteome. Proteomics. 10, 1141-1141 (2010). Wright, G. J. Signal initiation in biological systems: the properties and detection of transient extracellular protein interactions. Molecular bioSystems. 5, 1405-1405 (2009). Bushell, K. M., Sollner, C., Schuster-Boeckler, B. Large-scale screening for novel low-affinity extracellular protein interactions. Genome research. 18, 622-622 (2008). Durocher, Y., Perret, S., Kamen, A. High-level and high-throughput recombinant protein production by transient transfection of suspension-growing human 293-EBNA1 cells. Nucleic acids research. 30, e9-e9 (2002). Bendtsen, J. D., Nielsen, H., von Heijne, G. Improved Prediction of Signal Peptides: SignalP 3.0. Journal of molecular biology. 340, 783-783 (2004). Krogh, A., Larsson, B., von Heijne, G. Predicting transmembrane protein topology with a hidden markov model: application to complete genomes. Journal of molecular biology. 305, 567-567 (2001). Brown, M. H., Barclay, A. N. Expression of immunoglobulin and scavenger receptor superfamily domains as chimeric proteins with domains 3 and 4 of CD4 for ligand analysis. Protein engineering. 7, 515-515 (1994). Wright, G. J., Puklavec, M. J., Willis, A. C. Lymphoid/neuronal cell surface OX2 glycoprotein recognizes a novel receptor on macrophages implicated in the control of their function. Immunity. 13, 233-23 (2000). Dustin, M. L., Golan, D. E., Zhu, D. M. Low affinity interaction of human or rat T cell adhesion molecule CD2 with its ligand aligns adhering membranes to achieve high physiological affinity. The Journal of biological chemistry. 272, (1997). Wright, G. J., Martin, S., Bushell, K. M. High-throughput identification of transient extracellular protein interactions. Biochemical Society transactions. 38, (2010). de Wildt, R. M., Tomlinson, I. M., Ong, J. L. Isolation of receptor-ligand pairs by capture of long-lived multivalent interaction complexes. Proceedings of the National Academy of Sciences of the United States of America. 99, (2002). Jiang, L., Barclay, A. N. Identification of leucocyte surface protein interactions by high-throughput screening with multivalent reagents. Immunology. 129, 55-55 (2010). Urech, D. M., Lichtlen, P., Barberis, A. Cell growth selection system to detect extracellular and transmembrane protein interactions. Biochimica et biophysica acta. 1622, 117-117 (2003). Voulgaraki, D., Mitnacht-Kraus, R., Letarte, M. Multivalent recombinant proteins for probing functions of leucocyte surface proteins such as the CD200 receptor. Immunology. 115, 337-337 (2005). Wojtowicz, W. M., Wu, W., Andre, I. A vast repertoire of Dscam binding specificities arises from modular interactions of variable Ig domains. Cell. 130, 1134-1134 (2007). Martin, S., Sollner, C., Charoensawan, V. Construction of a Large Extracellular Protein Interaction Network and Its Resolution by Spatiotemporal Expression Profiling. Mol. Cell. Proteomics. 9, 2654-2654 (2010). Crosnier, C., Bustamante, L. Y., Bartholdson, S. J., Bei, A. K., Theron, M., Uchikawa, M., Mboup, S., Ndir, O., Kwiatkowski, D. P., Duraisingh, M. T., Rayner, J. C., Wright, G. J. Basigin is a receptor essential for erythrocyte invasion by Plasmodium falciparum. Nature. 480, 534-537 (2011). Sollner, C., Wright, G. J. A cell surface interaction network of neural leucine-rich repeat receptors. Genome biology. 10, R99-R99 (2009).